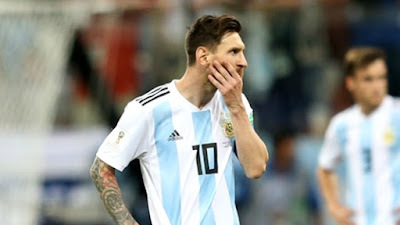 Argentina's legend, Diego Maradona, has advised Lionel Messi to withdraw from permanent international football as uncertainty about the future of the star with Albicileste continues. Messi did not play for his country after his abolition from the 2018 World Cup in the second round. Exit coach Jorge Sampaoli, while Messi has not been included in the two teams named by the interim boss, Lionel Scaloni. And while the star of Barcelona refused to confirm his international future, Maradona believes he should not return. "What would I say to Messi, not to come back anymore, to retire. "Under 15, losing and Messi is wrong, the list of matches in Argentina is confronted with Boca and Messi is blame, always blame, stops breaking my balls. "I would say to him:" Do not go anymore, man. "Let's see if they can handle it, let's see if they are really big men. "I would like to see him tell us all to go out because he is not responsible for not being world champions. Okay, all of us put our hopes, but when you go to the court you hope your horse will win and come eighth . "In Formula One, Vettel has a great machine and Hamilton hits him when the national team does nothing for me or for the people, we have lost that passion can not play against Nicaragua or Malta, we drop all the prestige we have won from the toilet, "said Dorados coach at Clarin today.